A volcanic eruption is imminent and the lava flow will destroy our colony. We must evacuate immediately. All Evacuation Transports have been loaded to capacity and are ready to leave. Computer projections have generated a list of the materials we need to survive. Quickly gather the remaining vehicles and supplies and rendezvous at the mining beacon northwest of our colony. Check the Specific Objectives for an exact list of what we need. Hurry, Commander. We don't have much time. Evacuate a Basic Lab kit. Evacuate a Structure Factory kit. Evacuate a Command Center kit. 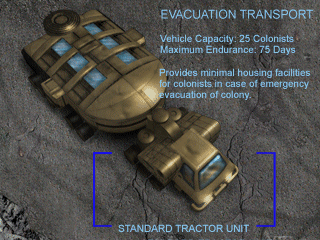 Evacuate the colonists in the 3 Evacuation Transports. Evacuate 4000 units of Common Metals. Evacuate 4000 units of food. Move all units and their cargoes to the mining beacon northwest of our colony.